The Barkin’ Biscuits team has embarked on a new fundraising component in partnership with schools and organizations in the greater Jacksonville area to generate awareness and support for the vocational training taking place in the NFSSE kitchen. If you’re looking for a fulfilling way to raise money for your school, church or community organization and want to make a difference in the lives of young adults with intellectual differences in the process, then look no further! 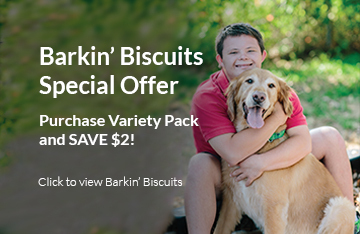 Team up with Barkin’ Biscuits, an all-natural dog treat baking operation out of North Florida School of Special Education, to financially benefit both your organization and the vocational training program for these special chefs. Collect money and orders from your supporters and receive a shipment once the fundraising campaign has come to a close. We will provide your organization with promotional information and collateral, order forms and individualized support. We can even create custom made-to-order biscuits for events, promotions, social functions, corporate gifts, and more! All you need to do is tempt the pet lovers in your life with these howlicious, all-natural dog treats! Fifty percent of the proceeds from all sales will go to benefit your organization, and the other fifty percent will be funneled back into the Barkin’ Biscuits vocational training program to provide opportunities for more young adults with special abilities in the Jacksonville community. In addition to supporting the mission of the North Florida School of Special Education and the expansion of the Barkin’ Biscuits vocational training program, the members of your organization will gain valuable experience in networking, marketing, sales and customer service. There’s nothing better than a little friendly competition to help build relationships and instill a sense of pride in making a positive impact both in your community and in the lives of many students! Please contact Ellen Hiser, Director of Berry Good Farms, at 904-724-8323 or ehiser@northfloridaschool.org for information on fundraising!